Megan Austin is a researcher at AIR, where she develops and directs research studies and technical assistance projects for the Midwest Regional Educational Laboratory (REL Midwest), Southeast Regional Educational Laboratory (REL Southeast), and the U.S. Department of Education Office of State Support. She also designs, leads, and conducts analyses for several quantitative and mixed-methods studies, including two IES-funded meta-analysis studies, and presents research proposals and findings to clients. As a state liaison for REL Midwest, she develops, strengthens, and maintains partnerships with a variety of education organizations. 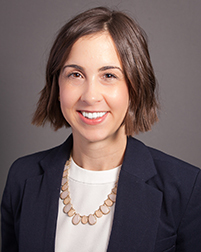 Prior to joining AIR, Dr. Austin helped manage a large research study of school choice in Indiana and has published several journal articles and book chapters reporting on study findings. Other research, which was funded by the American Educational Research Association and the National Science Foundation, has examined changes over time in students’ academic course taking in high school and early college success, focusing on low-income and first-generation college students. Dr. Austin has expertise in research design, quantitative statistical methods, students’ high school course taking and secondary to postsecondary educational transitions, and schools of choice, including charter schools, voucher programs, and magnet schools.